The death of Nancy Reagan yesterday takes one’s mind (gladly) off that other former First Lady and current Presidential frontrunner, Hillary Clinton, whose current mantra seems worlds away from the glamour and excess attributed to Nancy Reagan’s tenure in the 1980s. 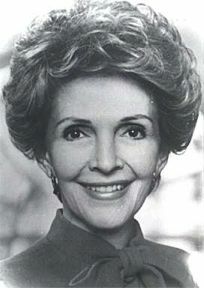 Nancy Reagan was a formidable First Lady, her commitment to her husband was unquestionable and she was known for having some considerable say in who Reagan was surrounded by at the highest level. Anyone who is old enough to remember the 1980s will be only too familiar with the political relationship between Ronald Reagan and Margaret Thatcher. Never before or since has the ‘special relationship’ been so publically demonstrated and regardless of Britain’s actual position of strength, Reagan and Thatcher cut a close bond. But whereas Thatcher’s ‘other half’, Denis, himself a very successful businessman steered clear of the limelight, Nancy represented that glamorous Dynasty style period like no other. She was every bit the First Lady but with it came a fair share of unfair criticism. Slated for changing the twenty year old décor of the White House (paid for by private donations) and for wearing designer outfits which were usually donated by designers she was unfairly treated in comparison to her predecessor, Jackie Kennedy whose tastes for the better things in life were readily overlooked by an adoring media and public. Regardless of political persuasion the role of the political marital partner is, by and large, thankless. Male or female, you are dammed if you do, lazy free loader if you don’t. Women especially, are unfairly seen as being given a token project but as so often is the case, what might be derided by the media has proven to be invaluable to those the work was intended and for Nancy Reagan that was the “Just Say No” campaign. Reagan’s anti-drug campaign was rolled out across schools and social clubs and she appeared on countless TV shows to promote awareness of drug addiction amongst those unable to check in at former First Lady, Betty Ford’s clinic. It was suitably derided as these things usually are and by those directly or indirectly affected by her unwavering support for her husband and the protection of his image at all costs. Following the diagnosis of breast cancer and the removal of her left breast as a result she talked openly about her illness and subsequent treatment, encouraging women to undergo yearly mammograms. In later years she would campaign strongly for the disease which robbed her of her husband long before he died. Ronald Reagan suffered from Alzheimer’s for ten years before finally succumbing to the illness in 2004 and the effects of that were plain to see during her public appearances. Long gone were those heady days of the 1980s when she held the arm of the most powerful man in the world yet she bore her predicament with grace and dignity and even the couple’s fiercest critics could not feel some sympathy for her plight with a man who no longer recognised her. In 1983 Gore Vidal wrote of her: ” Nancy’s career is now one of wifedom and motherhood and, of course, listening. Also in due course, social climbing” Well, she did all of that and some. She remodelled the role of First Lady and if nothing else was the embodiment of marriage and its fundamental values. Nobody could argue that.